Create a fantasy haven for your child! Fantasy children beds can be the focal point to a child's bedroom. The right bed can create such an impact that a theme could be built around this one item in the room. 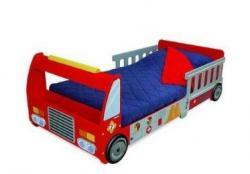 There are as many types of fantasy children's beds as there are different interests that children have. Girls often love fairy tales filled with knights, princesses, dragons and castles. Bring your daughter's favorite fairy tale to life with a themed bed. What about a bed that looks like Cinderella's coach, or a headboard that looks like a castle? 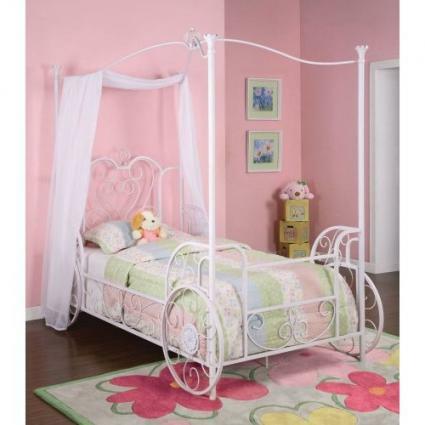 Canopy beds can make your child feel like a princess and tie into a princess theme room. Boys love bugs, fire engines, trucks and cars. There are many themed beds available to meet any of these interests. How about a bed that looks like a log cabin, or a race car or tractor disguised bed? You can get it at Amazon! Posh Tots--Offers beds for toddlers. Some of their more unique sleeping spaces include a toddler boat bed, a teepee bed, a gingerbread cottage, pirate, lighthouse, the fantasy princess coach mentioned above and a hockey bed. Child Crafters-Unique bed features crayons as bed posts, and the crayons light up at night for a fun night light. Can also be personalized with the child's name on the footboard. You can also buy matching lamps and coat hangers. Another inexpensive option can be to buy a tent that goes over an existing bed, or create a teepee, mosquito netting (for an African theme) or princess canopy. Many stores sell the canopies that attach to the ceiling for under $20. This simple canopy can transform a bed in minutes. For toddlers, consider buying a used themed bed. Children outgrow these beds much faster than they could possibly wear them out. You can usually pick up a fantasy bed in very good shape for a fraction of the cost of buying new. Try stores like Once Upon a Child and look in the local paper and on Craig's List to find a bed today. You may have to settle for what is available as far as color and overall style, but if you theme the rest of the room around the bed, then you'll have a themed bedroom that looks pulled together and as though a professional decorator completed it. Remember that small touches like pillows and matching lamps and curtains make a huge difference. Draw or paste a matching mural on the wall. Whatever theme you decide on, your child is sure to love his new fantasy bed in his newly themed bedroom. Sweet dreams!